SOLID AND DURALBLE: SGS Certified Gas Cylinder Holds up to 250lbs weight, Allowing You to Adjust The Seat Height From 16.2''-20.9''. NO SINKING After Years of Use. 【A Versatile Table with Separately Adjustable Back and Leg Rest】Do you need a massage table suitable for multiple people? 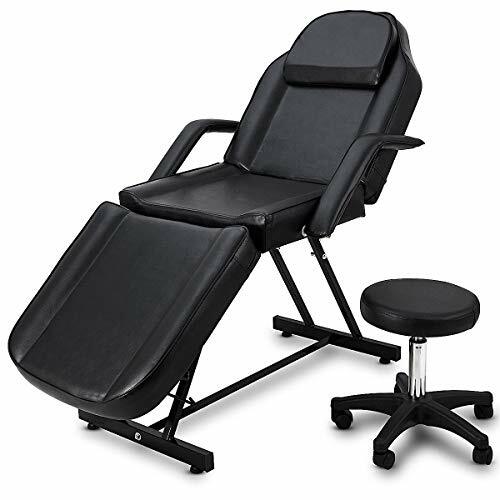 Our massage table has backrest and leg rest that can be adjusted separately and fold flat. 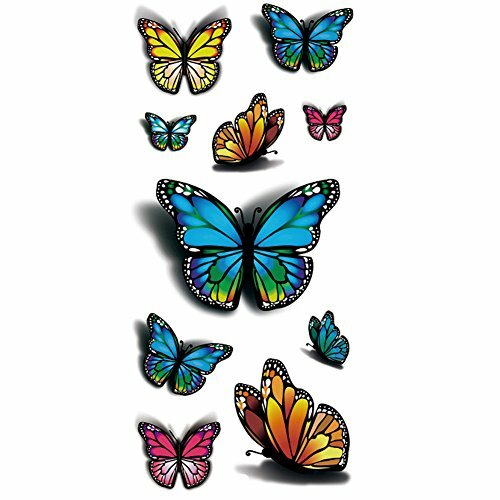 The length is 73 inches, suitable for people of different heights, men and women are not limited . 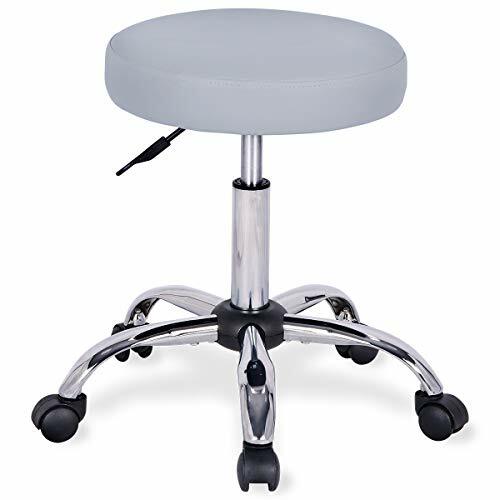 The adjustable table angle fits the human body curve, which is ergonomic and very comfortable. 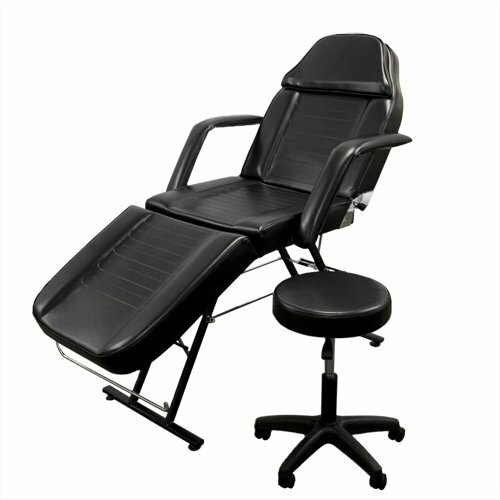 【Heavy Duty Steel Frame Improves Stability】Do you need a firm massage table? Then steel frame is a best choice to improve the stability and weight capacity greatly. Our steel frame is heavy duty and can withstand long-term use and remains stable, suitable for frequent use by different people, especially for commercial and home use. 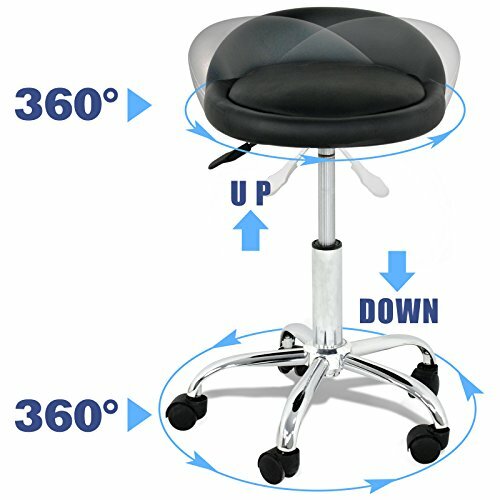 【With Free Stool to Adjust Height and Move Freely】How can I get the most affordable massage chair? 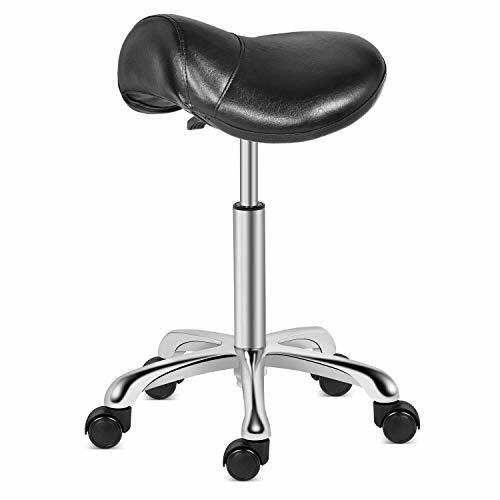 Of course, the one with stools that helps you relax while helping others massaging. 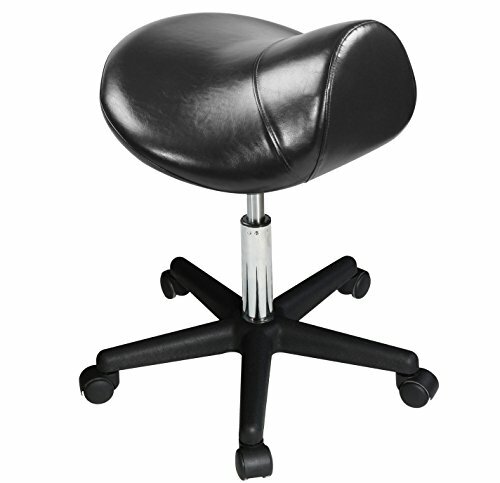 Our free stool is made of the same leather as the massage table and are not easy to tear. The casters are also specially made, not very cheap wheels. The height can be adjusted at your will. 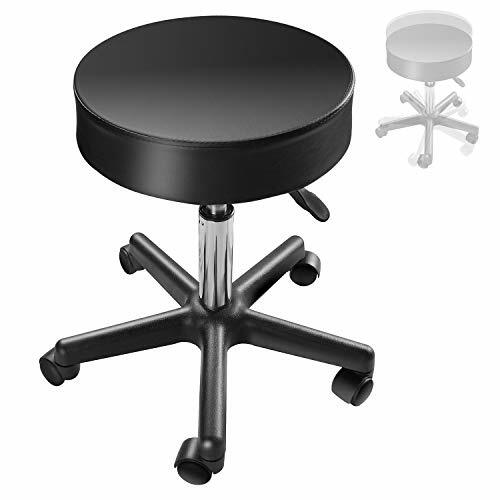 【Comfortable and Thick Padding Table with Armrests to Relieve Stress】When you lie down, you can place your arms on the side armrests to relieve stress. 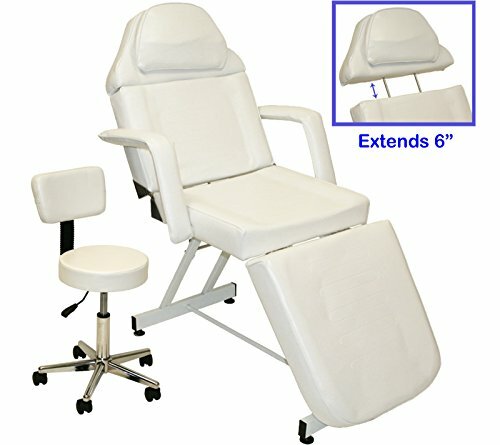 The entire massage table has a thick padding, and the leather is high-grade like a genuine leather touch. You won't feel stuffy and uncomfortable. 【Dual-Purpose Functional and Beautiful Massage Table】In addition to being a massage table, this massage table can also be used as an ordinary chair, and the backrest can be adjusted and also the chair with a comfortable padding. This chair bed is very functional and a dual-purpose adjustable table chair. 5 smooth rolling casters wheels. 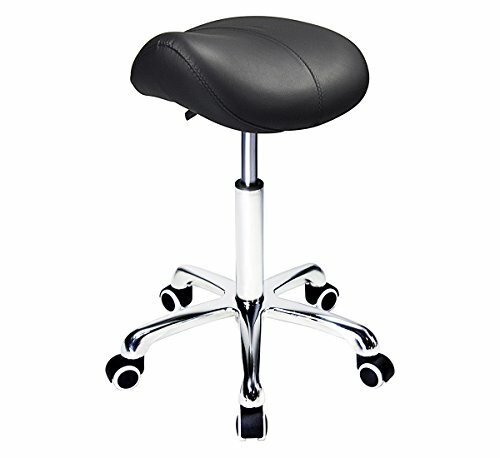 Saddle stool designed with ergonomic seat to encourage better posture & save your back and neck. Much more comfortable and relaxing than normal stool chairs. 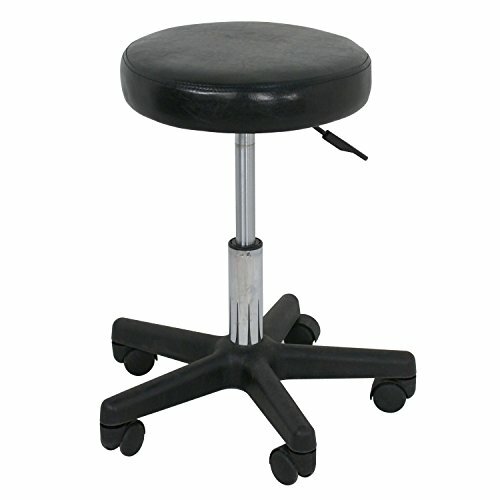 Heavy duty stool made of high quality materials, well constructed, sturdy and durable. Can support 350 lbs. 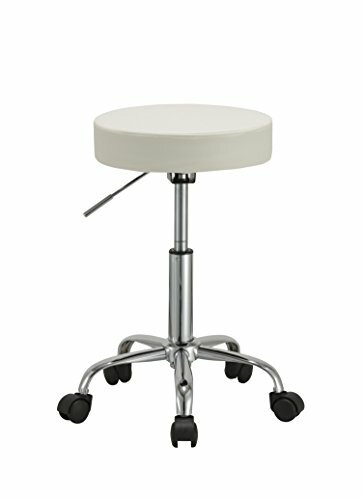 max weight.Stool chair with anti-exploding iron plate guarantees the safety of seat. 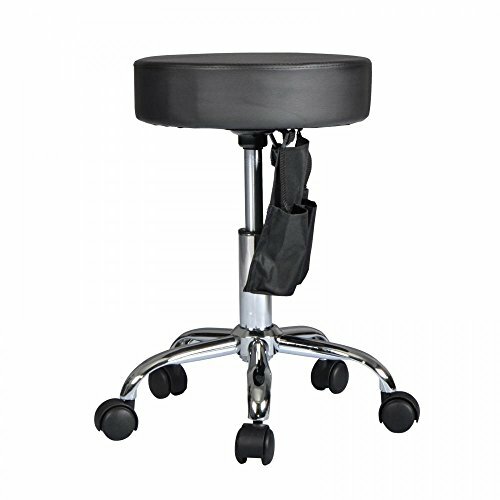 Hydraulic adjustable stool equipped with a smooth operating gas lift cylinder which adjusts height from 22" to 30" and makes seat 360° swivel. 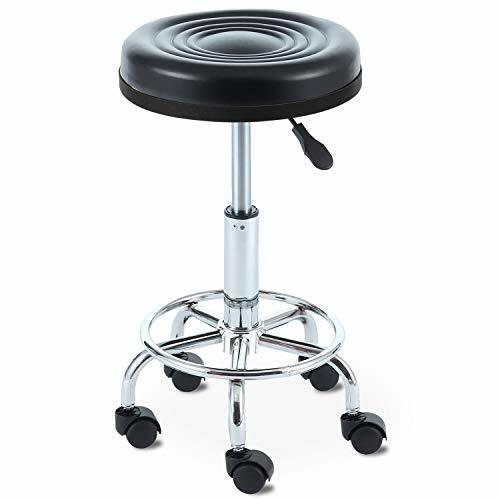 Smooth rolling stool with reinforced nylon twin wheel casters allow for easy movements and noisy-free environment,easy to roll on hard floor & safe for soft floor. Simplified and easy installation, no tools required.1 Year warranty. Customer service provided. 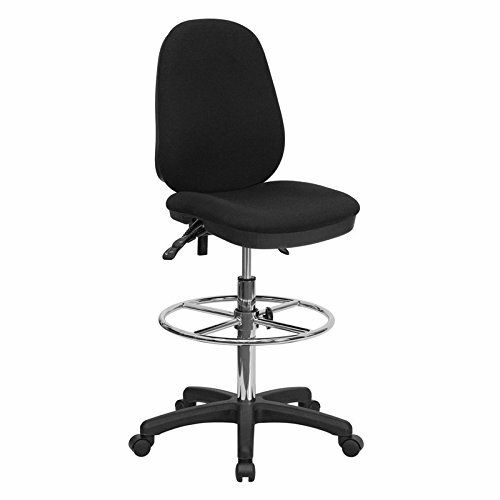 360 Swivel SEAT and HEIGHT ADJUSTMENT -- Hydraulic gas lift makes height adjustment as simple as the pull of a lever, adjustable seat height from 19 to 25 inches. 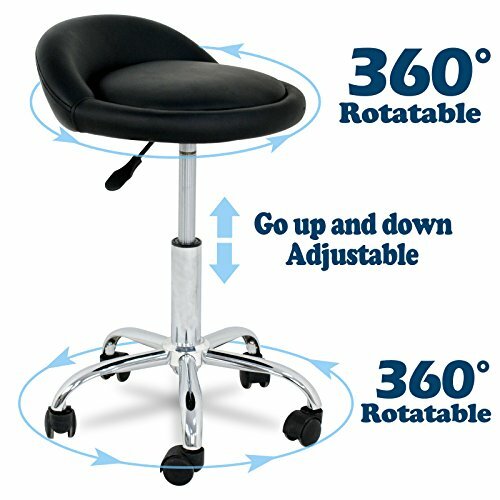 Adjustable seat height with back and 360°rolling round. Seat dimensions-14.2 D(Seat Pad) x 24 W(Base) x 18-23 H inches, suitable for all people. Sturdy wheel casters allow for easy movement; Attractive Surface on the base and gas lift with SGS / BIFMA Certification.Weight capacity is 300 lbs. 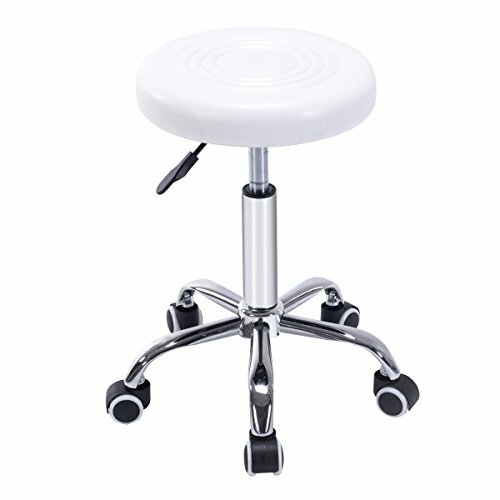 This stool is sufficient to meet various needs: Spa, Salon, Photo Studio, Cooking in Kitchen, Jewelry Bench, Painting Studio, Physician's Office, Classroom, Hair Salon, Guitar Practice, Art Studio, Vanity Table, Sewing Room , Counter, Drafting, Computer Desk, Lab, Spa, Office, Home, Massage Room. ※ Adjustable Height: Hydraulic gas lift makes height adjustment as simple as the pull of a lever,Adjustable height of 19" to 25"（From ground to the seat）. ※ 360 Swivel Seat: Pivoting seat swivels 360 degrees giving you the ability to switch directions, back and forth as needed, with ease. Generous 13.7"Dia permanently mouded seat pad offers you comfort. ※ Rolling Wheels: Five-Point dual swivel caster provides easy movement and extra stability, wheels roll smoothly on all surface types without causing damage. ※ Comfort Back: Soft padded back support for your rest. 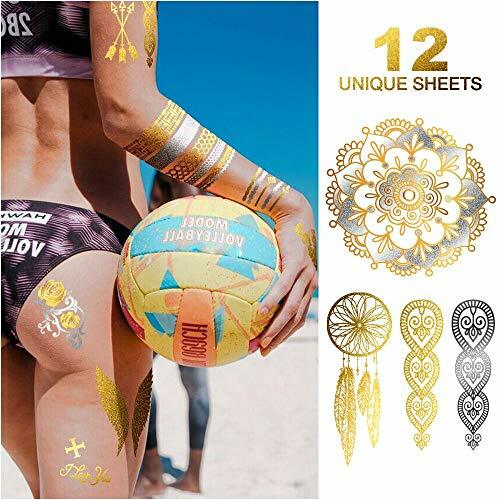 It is a nice touch as you relieve your back from stress.Perfect for reiki and other massage, also suitable for hair salons, beauty parlors, tattoo studios and many more. Easy Height Adjustment: Hydraulic gas lift makes it easier to adjust the height from 50.5cm/20" to 65cm/25.6". Simply pull the handle lever while sitting to lower the seat, or pull it while standing to make the chair taller. 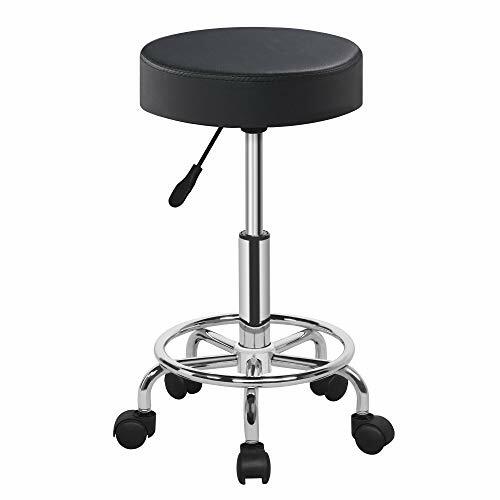 Universal: Salon Stool is suitable for barbershops, hair salons, tattoo parlors, doctor's offices, schools, offices, warehouses, home or automotive garages, behind the counter of retail spaces, and so on. ※ Adjustable Height: Hydraulic gas lift makes height adjustment as simple as the pull of a lever,Adjustable height of 18" to 23".★★★★★★【Warm note】: Pls remove the black plastic on the top of gas lift before assembling. ※ 360 Swivel Seat: Pivoting seat swivels 360 degrees giving you the ability to switch directions, back and forth as needed, with ease. ,generous 3.5" density permanently mouded seat pad offers you comfort. ※ Rolling Wheels: Five-Point dual swivel caster provides easy movement and extra stability, wheels roll smoothly on all surface types without causing damage.Diameter of the wheel:1.97"
※ Updated Base: Base has been upgraded to Nylon,which is flexible and absorbs pressure far better than the previous plastic material.It is now stronger and more durable. 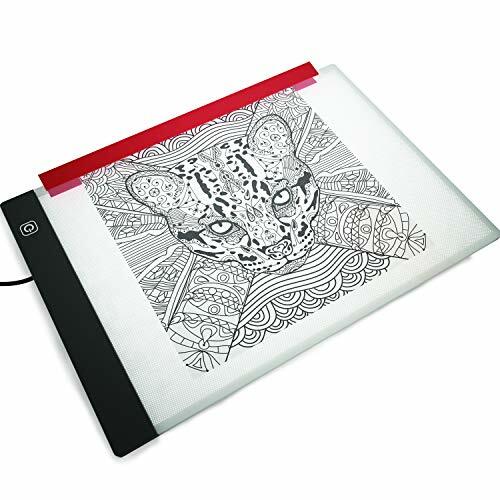 ※ Modern design that fits perfectly in every home or commercial use. 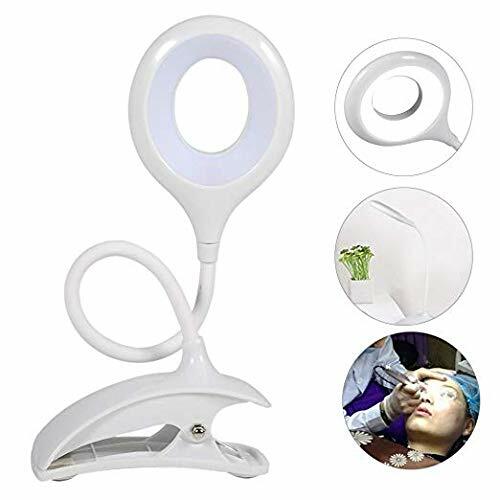 It is ideal for salons, barbers, tattoo shops, beauticians ,doctor offices and home use! This stool is lightweight and practical and easy to assemble! Weight 8 lbs,capacity :250 lbs. 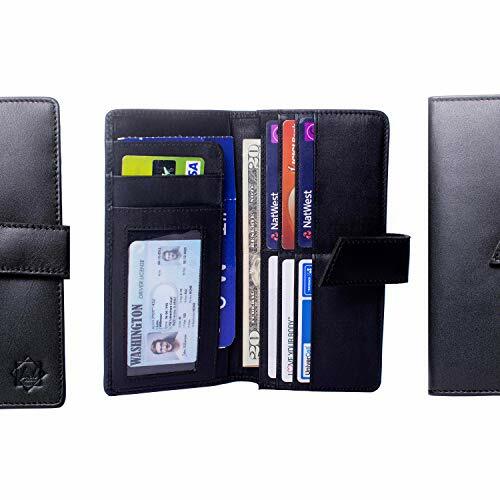 【Comfortable】 Durable PU leather which is water and oil proof, abrasion resistant.Memory foam filler increase comfort. 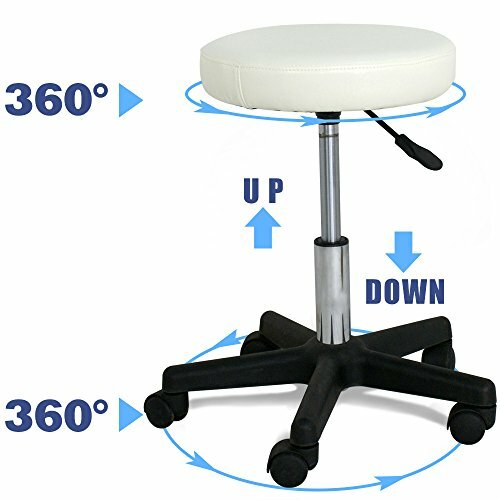 【360 Degrees Swivel Rotation Seat】360 degrees swivel design gives you or your guest the freedom of movement and the convenience to communicate with others in any direction. 【Easy Movement】Rubber coated casters for the noise-free movement, easy to roll on hard floor.And 5 Smooth wheels for stability. 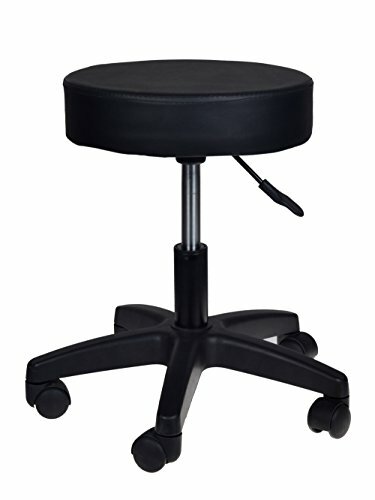 【Height Adjustable】Economical black rolling stool with hydraulic lift.Adjustable handle under the seat adjusts the height from 18" to 23".Meet different height needs. 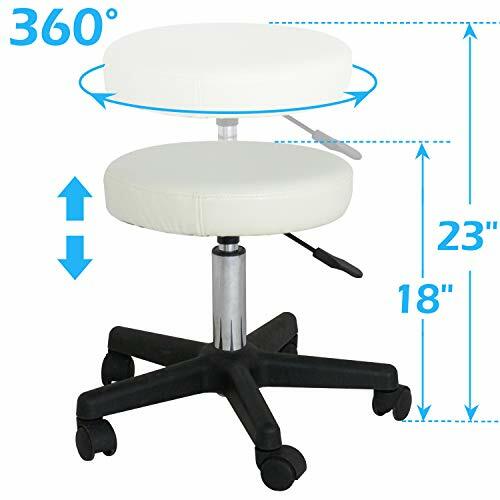 【SMALL AND CONVENIENT DESIGN 】--Measures 16.5 by 16.5 by 18.1 to 24 inches (LxWxH); Diameter of seat pad:12.6", Seat pad thickness: 2 inches, Compact design makes this stool ideal for use in small spaces where extra seating is needed. 【SEAT HEIGHT ADJUSTMENT 】-- Adjustable seat height from 18.1 to 24 inches as Hydraulic gas lift makes height adjustment as simple as the pull of a lever. 【FOOT REST】--Comfortable foot rest makes getting on the chair easier, and provides a place to rest your feet when the chair is adjusted to a high level. 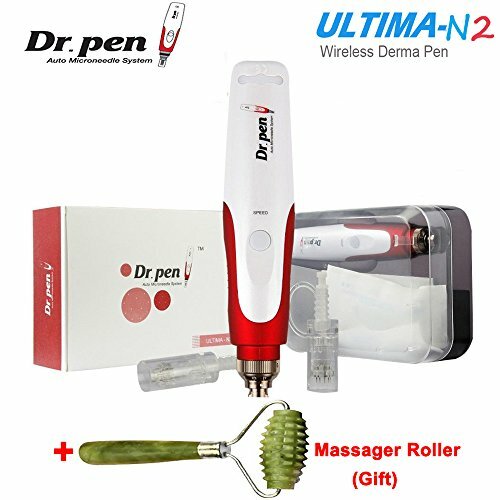 【MULTIFUNCTION 】-- It is ideal for barber, salons, lab, warehouses, art studio, garages, tattoo shops, beauticians ,doctor offices and home use. 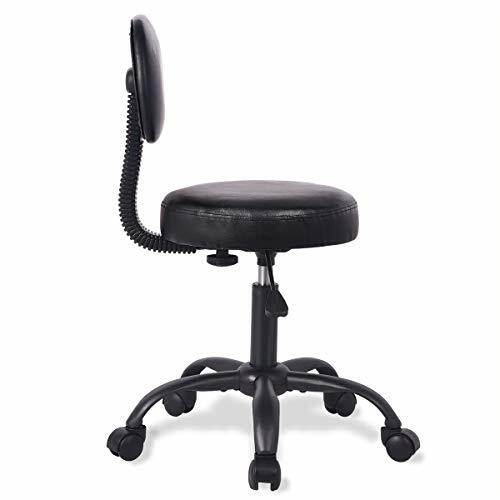 ★ With a fully adjustable height, this chair can fit you no matter how tall. 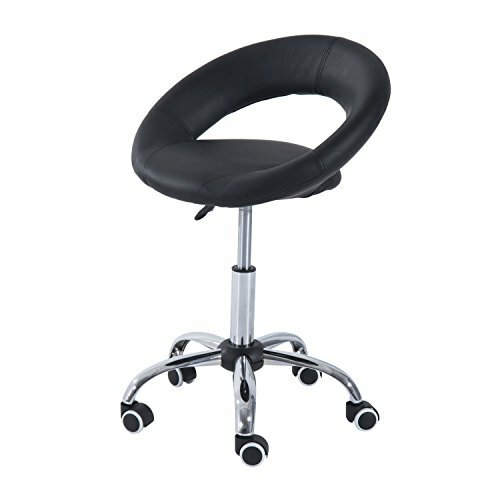 The chairs are faux leather padded measuring up to 27" for a sleek appearance while still providing ultra-soft comfort. Adjust the seat to your preference as it can move from approximately18" to 24.5". 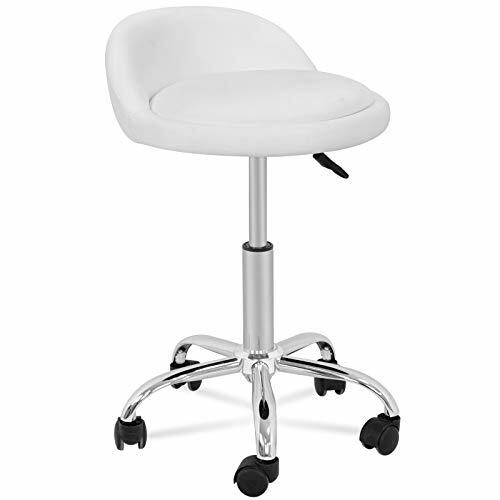 ★ Compare to backless stools on the market, it features a soft padded back for your rest. It is a nice touch as you relieve your back from stress. Add a touch of style with this chair and let go of your worries in comfort. 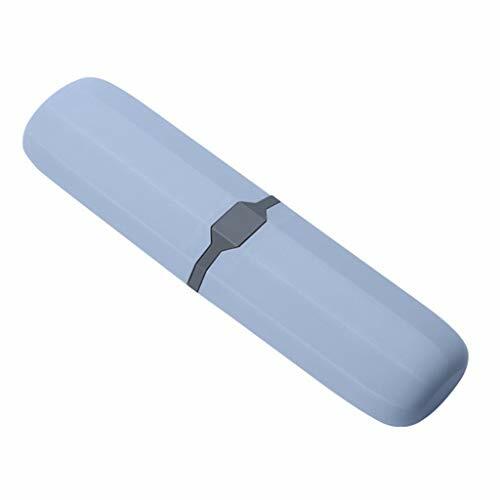 ★ Rolling base has been upgraded and is now stronger and more durable than our previous model, but still remains lightweight, and is more dense and weighs slightly more than the previous model, adding more support and strength. 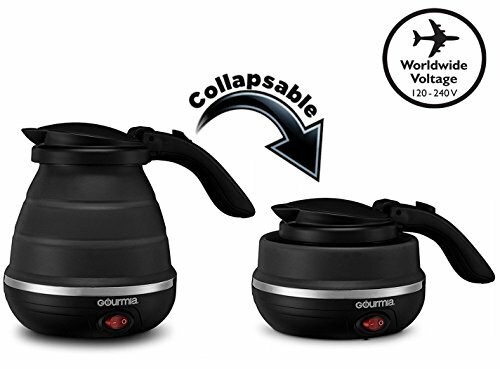 ★ Pivoting seat swivels 360 degrees giving you the ability to switch directions, back and forth as needed, with ease. 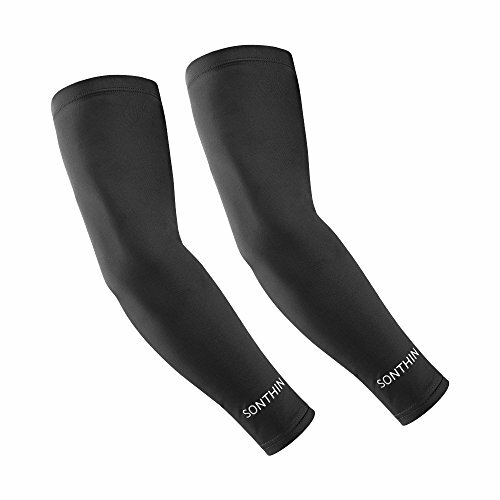 Ideal for professions or hobbies that require repeated swift movements or changes in orientation. 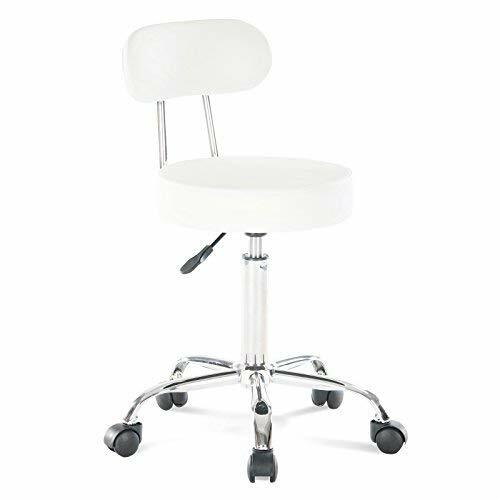 ★ Compact design makes this stool ideal for use in small spaces where extra seating is needed, such as hair and beauty salons, tattoo studios，medical place or anywhere else a chair like this may come in handy. The chair is easily assembled and comes with everything needed to put it together. 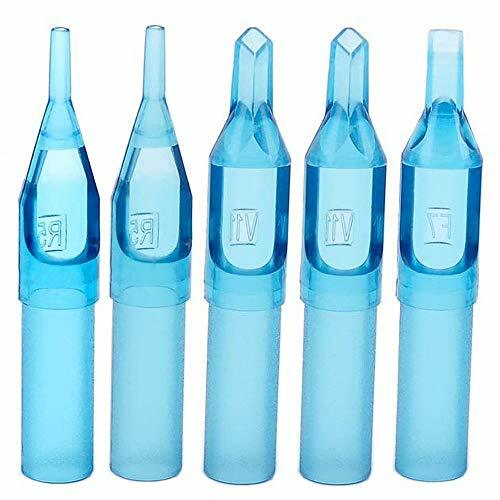 ※ Easy assemble and clean: Simple assembly required, easy to install and clean,screws and tool needed is included. ★★★★Warm Note:Remove the black safety cap from the hydraulic pump before installation. 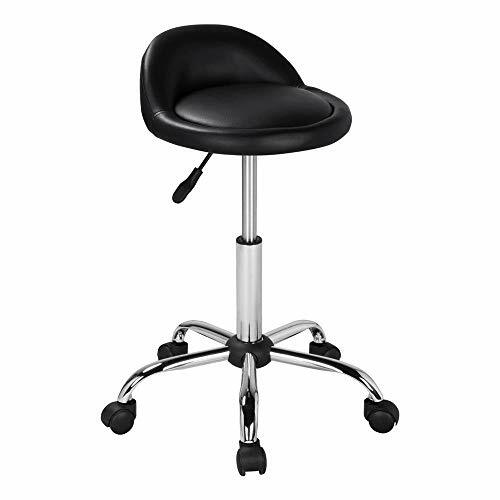 ※ Height Adjustment: The stool's height is fully adjustable and keeps the clients within reach while in a sitting position,Adjusts smoothly when the lever handle is pulled up and down,Seat Height adjusts from 18" to 24.5",overall stool Height adjusts from 21" to 27"
※ Thoughtful Design: 360 degrees swivel for optimal angle without moving the stool,Slides effortlessly on adjustable galvanized gas-lift,5 rolling heavy duty casters for easy mobility,anti-slip wheels for safety purpose. 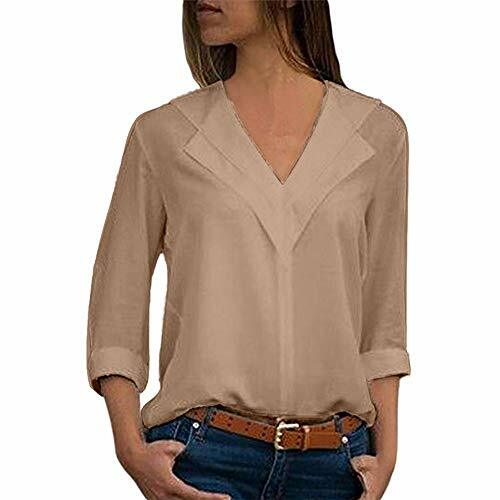 ※ Multifunctional: Soft padded back support for your rest. 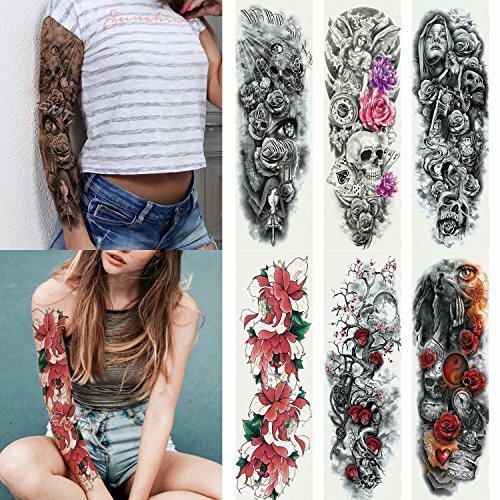 It is a nice touch as you relieve your back from stress.Perfect for reiki and other massage, also suitable for hair salons, beauty parlors, tattoo studios and many more. 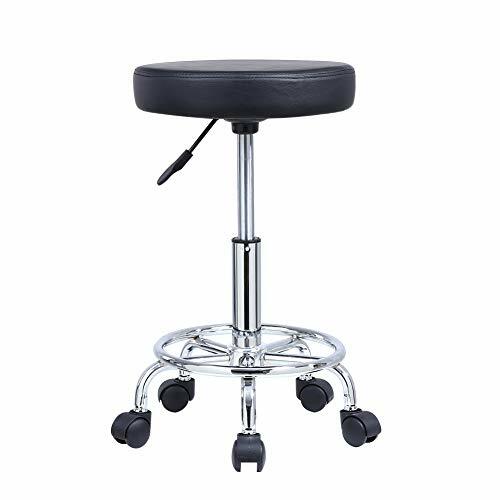 【Retro Style】This stool combines retro and modern style, which is perfect for your home, office, bar, beauty salon, massage or tattoo parlor. 【Comfortable Design】The ergonomically designed seat makes you feel more comfortable. 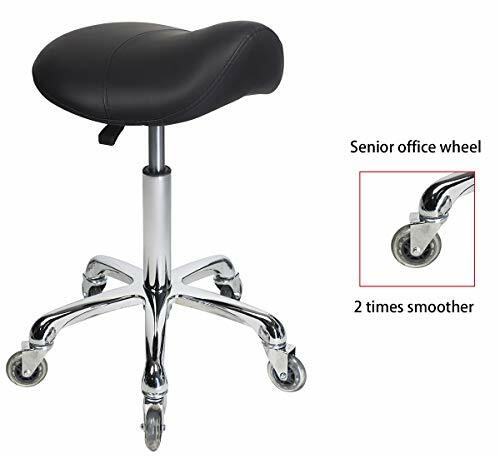 And the chrome frame strengthens the durability and stability of this stool. 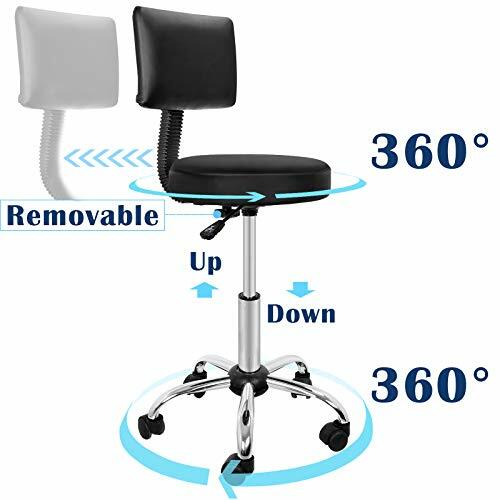 【360 Degrees Swivel】360 degrees swivel design gives you or your guest the freedom of movement and the convenience to communicate with others in any direction. 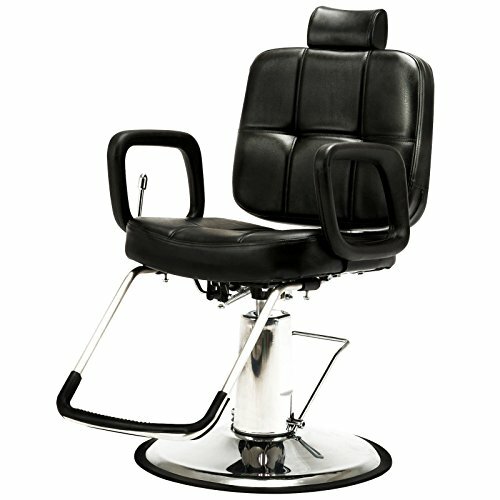 【Height Adjustable】The side pneumatic handle adjusts the height from 18.5'' to 24.8" easily and safely. 【Easy Movement】5 universal steering casters provide flexible mobility to go here and there smoothly. This salon stool is made of high quality PVC leather and 3 1/4'' thick foam cushioning seat for maximum comfort. 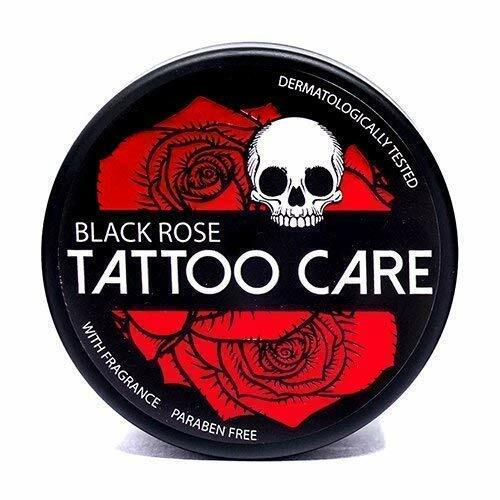 It is widely used in hairdressers, beauticians, barbers, dentists, tattoo makers. 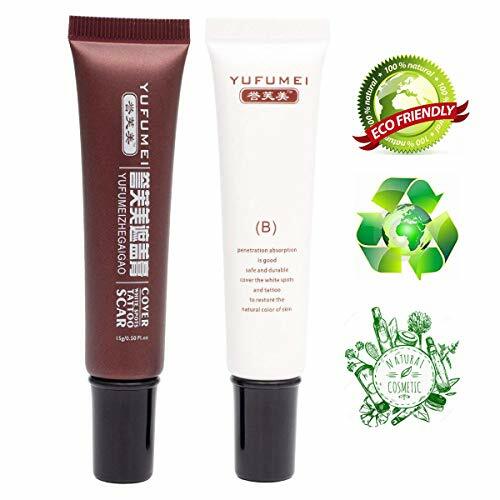 Hydraulic design is convenient to adjust the height for better suitable position. FeaFeatures: Plastic Base, 250lbs Capacity. 360 Degree Pivoting Seat. 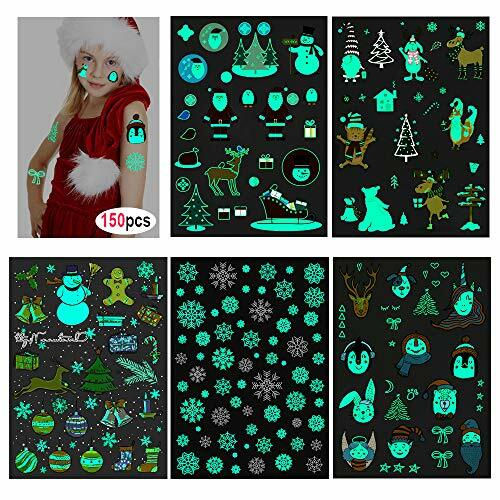 Durable PVC Leather best for Salon Using. 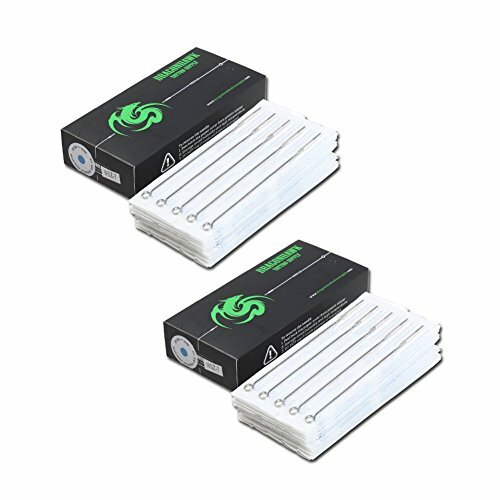 High density sponge, not producHigh density sponge, not produce distortion. 3 1/4''Thick Foam. Large 14'' Diameter Round Seat Surface. Hydraulic Height from 16 1/2'' to 20 1/4''.20'' Diameter base Dimension. 8 1/2'' L 5-leg Base. Adjustable height of 20.5" to 27.5"; Weighs 11lbs but supports 550lbs. Overall Dimensions: 71"(L) x 24"(W) x 30"(H); Weight Capacity: 500 lbs. Adjustable seat height with 360°rolling round. Seat dimensions-14.2 D(Seat) x 24 W(Base) x 18.1-22.8 H inches, suitable for all people. 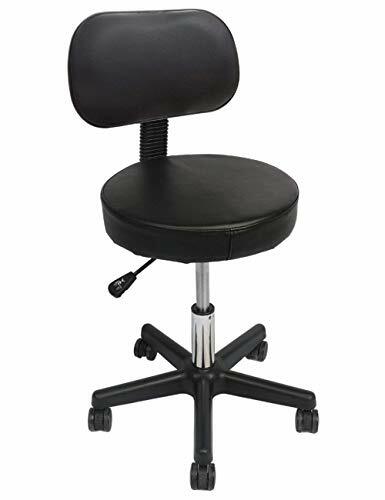 This stool is sufficient to meet various needs: Spa, Salon, Photo Studio, Cooking in Kitchen, Jewelry Bench, Painting Studio, Physician's Office, Classroom, Hair Salon, Guitar Practice, Art Studio, Vanity Table, Sewing Room , Counter, Drafting, Computer Desk, Lab, Office, Home, Massage Room.